Access to the facilities of the PLUS AREA. BUFFET MEET that includes (soft drinks, fresh water and coffee). ACCESS to the beach, and natural pools. Routes in THREE UNDERGROUND RIVERS (includes security bag for the route). SHOWS AND EXHIBITS (Charrería, Voladores de Papantla and Prehispanic Dances). Presentation of "XCARET MÉXICO ESPECTACULAR". Visit to the CORAL REEF AQUARIUM, the MARIPOSAIRE and the AVIARY. LIFE JACKETS and FLOATING RIMS. 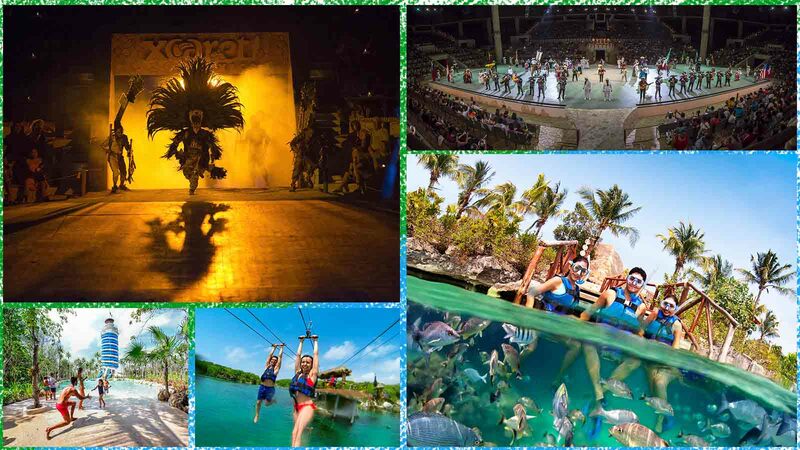 The Tour to Xcaret Plus allows you access to all the attractions such as: Mushroom Farm, Orchid Greenhouse, Jungle Path, Aviary, Scenic Tower, Papantla Flyers, Ball Game, Charra Party, Archaeological Vestiges, Mexican Cemetery, Town Maya, Chapel of San Francisco de Asís, Tour in the Underground River, Rafting on the Paraíso River, Beach, Caleta, Visit to the Coral Reef Aquarium, Sea Turtles, Manatí Lagoon, Bat Cave, Butterfly House, Refuge de los Venados, Isla de los Pumas y Jaguares and Isla de los Monos. At nightfall, you will be our guest of honor at the presentation "Xcaret México Espectacular", a light and color party with 300 artists that will take you through the history of Mexico, let yourself be pampered by our music, the mariachis and much more, come Live it to Believe it! Swim with Dolphins and Optional Activities, it is reserved directly in the Park. Food and drinks outside the restaurant (before and after lunch). Juniors / Minors are considered as long as their height is not greater than 1.10 meters and the age is between 5 to 11 years (in some cases it will be necessary to present identification: passport, school credential, birth certificate, etc.). $ 139.00 Juniors 5 - 10 Years.